Twitter rolled out new version Twitter application for Android and iOS devices such as Twitter 4.0 for Android and Twitter 5.5 for iOS devices. Both Android and iPhone version contains new features, now you can install and launch your favorite apps from tweets. you’ll see username and hashtag suggestions, making it easier to connect with friends and join conversations. 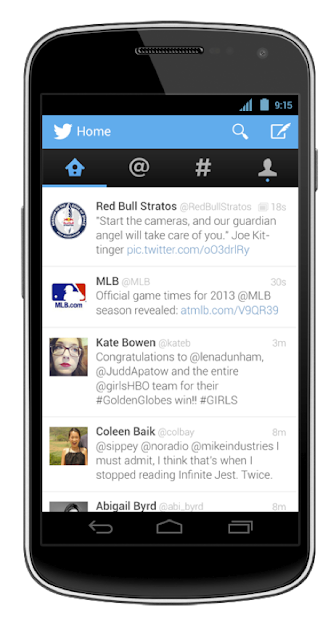 Twitter for Android 4.0 brings brand new look and other new features. With this new version You can now quickly navigate between tabs by swiping across your screen. Twitter 5.5 for iOS devices includes faster launch times and general performance upgrades. And also twitter new version contains various improvements and bug fixes. Click on the below download links to get latest version of Twitter application for your Android and iOS devices.